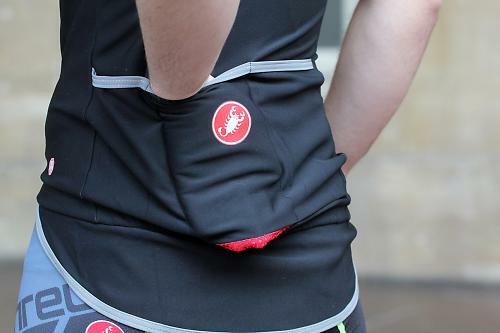 Castelli's Gabba waterproof jersey needs little introduction. Since it came out in 2010, it has taken the pro peloton, and non-fairweather cyclists by storm. 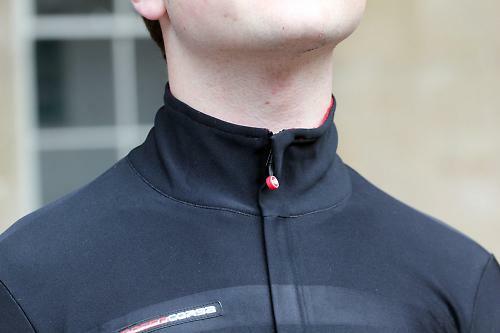 And that's fair enough really, who wouldn't want to make their bad weather riding a bit more comfortable? A quick recap: The Gabba is made from Gore X-lite plus, a lightweight windproof fabric with water-repellent properties. It's designed by and for pros, so the fit is tight and racy. It has a storm-flap at the rear to protect the rider from wheel spray. We're on the new and improved version now, imaginatively called Gabba 2. The biggest difference, and improvement, is the introduction of a wind flap for the full-length zip, keeping more wind and rain out than the previous version. The eyelets in the rear pockets have been replaced with mesh fabric at the bottom of the pockets for better drainage. Other features have remained the same: the aero fit, reflective piping on the three pockets, full-length zip, high collar and gripper hem. I guess by now it'll be clear that pros like this one for racing in foul conditions, but where does it fit in for those not racing? I like wearing it in any weather that doesn't involve sunshine: any combination of cloudy, windy and rainy. Even though it won't keep you dry in anything more than a shower, it will still keep you warm by virtue of it keeping the wind out. That collar is great at keeping you snug, and the storm flap keeps off the worst of the grime thrown at you from your rear wheel. 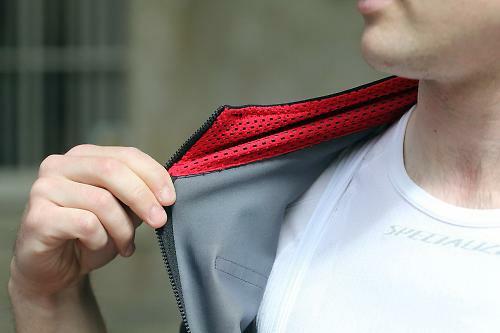 For me, it's best worn with a baselayer – the windproof material isn't the nicest next to skin. When it's a bit colder, it works well with windproof armwarmers, like Castelli's Nano Flex ones. Temperature range is a tricky one as it depends on wind and rain, but I'd say from about 8 degrees up. Last time we reviewed the Gabba, in 2011, there was nothing like it on the market. Mat predicted that other manufacturers would be trying to copy it. That they have, in droves: Nalini, Gore, Endura and stolen Goat are among the brands that have a windproof jersey in their range. Of these, I've only used (and reviewed) the Nalini, which is more towards the waterproof jacket end. Of the two, I prefer the Gabba. Jez has both a Gabba and a Stolen Goat Orkaan (which he reviewed), and reckons the latter out-Gabbas the former. All I can say is that the Gabba 2 is a cracking all weather jersey, and I recommend to anyone riding in bad weather, even if it costs a fair bit. The Gabba's claimed weight is 260 grams, though the size Large I tested weighs 304 grams on my scales. It's available in sizes Small to Triple XL, in black, red, yellow, green and blue, and is also available in a women's version. We invented the Gabba as a no-compromise race piece. We didn't expect it to be a huge commercial success, but we did expect it to give our pros an unfair advantage. We were mistaken on both accounts, especially the latter, because practically every pro went out and bought a Gabba and covered up the logos. And nearly every competitive company has come up with a copy. But the other pro riders still want this one. This one piece will change how you dress for cool conditions. Products like the Gabba jersey define Castelli: innovation, performance, and creating products that change pro racing and make you more comfortable. The original Gabba has taken the peloton by storm since its introduction in 2010, with most pros buying or begging their way to the must-have piece for cold-weather racing. Based on pro rider needs, created to offer a tangible competitive advantage and developed in a no-compromise pursuit of performance, this jersey represents the essence of who we are. It keeps me warm in foul conditions, thanks to its windproof and water resistant properties. It's not the lightest if you're comparing to other jerseys. It's lighter than a jersey and waterproof though. Fits like a glove, keeps me warm with much less boil-in-the-bag than a waterproof. £150 is not cheap for a jersey, even one that is windproof and waterproof. The Stolen Goat Orkaan that Jez reviewed here, and liked a lot, is considerably cheaper, as are offerings from Gore and Endura, though we haven't tested those. Still, it's made by Castelli, and it's damn good. It does what it says on the tin, keeps you as comfortable as is possible in foul weather. I don't have to think about what to wear in bad weather. There may be cheaper alternatives on the market now, but Castelli's Gabba is still exceptionally good at what it does: making riding in bad weather a lot less miserable. So many people just looked at waterproofing and didn't understand this bit : "Even though it won't keep you dry in anything more than a shower, it will still keep you warm by virtue of it keeping the wind out." Riding tempo in the wet a gabba will keep you warm, it was never meant for cold wet endurance LSD rides. I got the long sleeve V1 first then short sleeve V1 they have been used a lot, very durable and for me were a great buy. Fyi recently the thermo 2 suit was on sale for £140. Considering this incorporates the gabba 2 and sorpasso tights with strapless comfort I reckon it was one of the best bargains in the sales. My original short sleeve white Gabba is still going and still white (surprisingly). Not cheap (although mine was, got it for £65 from PBK back in the days of their crazy sales) but they're soo versatile. Is it worth the extra money for the convertible version? Or would the short sleeve with good arm warmers (nanoflex) do just as good a job? No Castelli, "I can get a jersey like that in aldi and it's just as good" comments? Didn't find it (the original gabba) as breathable as I hoped to be honest and the nanoflex arm warmers were a bit crap in my opinion...my body overheated yet my arms were cold. Used mainly on my commute where I do run hot to be fair...better for lower intensity sunday rides. Still a good product though they have a lot more competion these days. A couple data points for me personally regarding temperature range (according to my notes). With a merino base layer and nanoflex arm warmers it's good down to 5C ish. With a mesh poly base layer it's good to 15C in cool wind unless I'm hammering it. It gets sweaty about 17C. When it's wet and you've stopped it gets horribly cold. Note: never wash it in normal detergent; I'm not sure if mine was faulty, but just two washes destroyed the DWR coating even though there was no fabric softener. I picked one up in Evans Cycles this week (Short Sleeve Gabba 2) for the princely sum of £94.99). Bargain! Probably still a bit warm this week in London to test it properly but it seems I won't have long to wait for cooler temperatures and biblical downpours to test it fully. This isn't Rapha. Just my personal survey but out on Sportives I'd say Castelli was the UKs No.1 cycling clothing brand. True it is not cheap, people will climb up the quality/expense gradient up to Castelli; before Assos and then Rapha drop off a cliff. 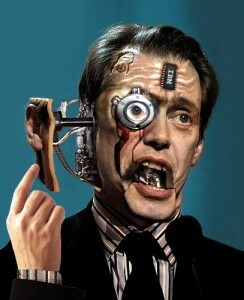 People can feel the technology in what they are wearing too. "Personally I'd use the arm warmer approach if only because it looks nicer. " True, also with the LS jersey I had an off and trashed a sleeve. With the SS the end result would only have been a spare arm warmer. Not sure if the converter jacket sleeves are as easily/affordably replaced. It wasn't cheap, but on a cost per mile basis, my Gabba 1 is almost certainly my best performing bit of cycling kit. I've worn it in all sorts of conditions, and for several triathlons this "summer" and will continue to use it regularly through the autumn and winter. Might now consider getting a 2 so riding consecutive days can be done more easily! £116? Top effort, you get the magpie award! I got mine in February from Evans, got to use it a fair bit and it really is great. Snug, comfy, as aero as you're going to get in full length crappy weather ninja gear. Below 5C the legs were still fine but the top got a bit chilly. Still at that temp I would normally be wearing a winter jacket not a gabba. It did occur to me that stacking it in the thermo suit and destroying a sleeve or leg would be 'unfortunate'. I did Newcastle to London 24hr a couple of years ago. It rained for 17 of the 24 hours and the Gabba short sleeve along with Nanoflex arm and knee warmers, helped keep me going. Far and away the best bit of kit I've ever bought. Yeah, same thought had occurred to me. Think I may be able to beat the magpie award though for the Thermosuit. Managed to pick up a San Remo Velocissimo speed suit from the well known Catelli outlet for just £64! Now that is a lush bit of kit for the summer and cheaper than either the top or t he bottoms on their own. For comfort, speedsuits are the way forward, but only really make sense when they crop up in the sale. Blooming expensive otherwise. the last jersey I bought from aldi fell apart at the seams after just 2 weeks - my gabba mk1 survives after untold downpours and a trip down the tarmac and it shrugged off the best attempts of a 4" angle grinder to shred it alive, so I have every confidence that the mk2 I bought 6 months ago will carry on doing its job of keeping me warm and making rainy weather bearable unlike the cheap tat aldi sell. Smashing jacket in both short and long sleeve versions but with a fairly limited temperature range. I have worn mine in torrential downpours and drizzly days and provided the temperature is below about 10 degrees it's great. If it warms up, the Gabba becomes a sweaty mess quite quickly and I'll end up riding with it fully unzipped. Predictable performance in the rain is it's major selling point; it will keep you dry for a hour, it will keep you warm for three hours. Bought my Mk2 in the sales before the Transcontinental Race for about £90 and it proved to be incredibly versatile. I wore it overnight, on mountain descents, in temperatures up to 40 degrees, in my sleeping bag, through torrential rain in Macedonia and drizzle in Slovenia. OK things got a bit warm at times, but the full length zip allowed sufficient ventilation in all but the hottest conditions. In combination with a lightweight climbers jersey and packable rain jacket, I was never left cold or miserably wet. A great bit of kit. Magpie? My Garmin Cannondale Long Sleeve was £74. Beat that. Anyway, the thermosuit 2. My understanding is that isn't a Gabba jersey. It's a Transparente. I've owned both. Quite different. £74 for a LS Gabba is outstanding. The Transparente top was used on the mk1 Thermosuit, but the mk2 version uses a Gabba (although sans chest vents). I know it's wrong but I'm kind of wishing for cooler weather now so I can use it! That sounds great. I'll definitely pick one of those up on clearance next year! I've had loads of bib tights. Up to Assos Bonka and Habu ones. And, frankly, the Sorpasso are better than all of them. And from such light weight. Several of the guys in my club wear Gabba in the cooler months. Most of the time it is cool/cold but dry, and in those circumstances jerseys like the Alpha and Trasparente (I use both) seem a better bet in terms of breathability, warmth / ability to layer. I almost exclusively ride in Castelli, and although I've got as far as putting a SS Gabba in my shopping basket several times, but I'm not so sure it's the right choice. For racers whose energy will keep them warm if wet, the aero advantage is a big selling point. For those of us on club type rides, I have to wonder if its so much better than a well fitting wind jersey with a packable waterproof shell if rain threatens. I own both the long and short sleeved Gabba2. These are by far my favourite pieces of kit. Wear them with Castelli's Flanders base layer and I'm happy and warm down to 5ºC. Add the matching Fawesome Gillet and you're set for most winters. I've even stopped taking my rain jacket in marginal weather as I find light showers are easily repelled by the Gabba. My only quibble would be with the tail flap. I love this when its wet, but in the dry I find it slightly irritating and I fold it up under the main hem line. Its a first world problem. Got both the SS (£70 Tredz) and LS (£97 from BikeDiscount). The are great for colder weather but have found they need constant treatment for the water to bead off. Anyone know any current good deals on these on the internet? Can only find around the £110 mark for short sleeve.. unless a stupid big or small size. In my top 5 bits of kit. It's great, I'll wear down to the point where it's too cold to ride due to ice risk, just add more merino. I've been told running a very mild iron over it restores some of the water resistance? Anybody tried it or is it BS, never dared to give it a go.. Instead of ironing try tumble drying it for 20 minutes on the very lowest heat setting. This has worked to restore DWR multiple times for me. Cheers I'll try that seems like safer bet than the iron. From what's going out there tonight I'll be digging it out sooner rather than later..